What will the future of yachts look like? The Hinckley Dasher is an unexpected answer due to its conservative exterior but don’t judge a book by its cover. The sleek, stylish, and first fully electric luxury yacht has a foreseeing future. The minimalistic 28-foot yacht, designed by Michael Peters, is overshadowed by its cutting-edge technology. 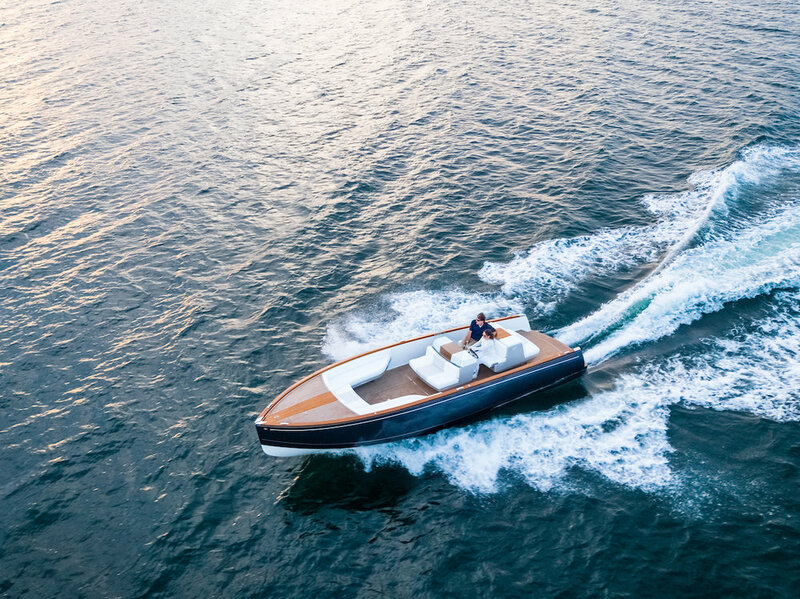 True luxury for the Dasher lies in the 3D printing of boating hardware, which is an advancement in itself for the boating world. In doing so, the overall weight of the Dasher minimizes to only 6,500 pounds. And, the speed? Expect to reach 23 knots. The maximum range at 20 knots will be 40 miles. Thankfully, it’s completely silent and stealth because spilling Armand de Brignac on the Hublot is non-negotiable. The Dasher has a deep-V hull with a plumb bow and is propelled by twin 40 kWh BMW i3 lithium-ion batteries driving 80 hp straight shaft inboard motors. These are the same batteries used in the BMW i3 automobile and should last 9 years or 9,000 cycles. The Dasher, named for the first Hinckley Picnic Boat ever built, has a 30-amp shore power setup but can also charge with dual 50 amp connectors. With the latter, four hours is all that’s needed to charge from zero to full, which may be a little faster than a Tesla. Furthermore, its technological features are the hidden cup holders that slide out with just a tap. And, a windshield that lowers electrically so the driver can converse with their guests seated in the bow. The proprietary touchscreen navigation and digital switching system are as discreetly integrated as everything else. Aside from innovative, the Dasher is completely sustainable. It’s a rare feature amongst many in the yachting world. The artisanal teak is hand painted faux wood to look like grain-matched true wood trim. Hinckley is onto inventing a new classic for the modern and contemporary yacht owner.